After opening strongly, Wall Street pared their gains on Monday but generally finished in the green recovering some ground from the sharp sell-off on Friday. The market interpreted the latest Trump tweets as signalling a softening of the US stance and increasing the potential for a negotiated outcome. The Dow ticked up 0.19%, the tech-heavy Nasdaq was the strongest major index, gaining 0.51% and the S&P 500 advanced 0.33%. This week also marks the start of earnings season with the big US banks such as JPMorgan Chase, Citigroup and Wells Fargo all set to report first-quarter results on Friday. Some of the major Wall Street investment banks have foreshadowed a strong set of results. I have been writing for the past few weeks that focus will soon turn back to corporate profits and prospective valuations, particularly now that the S&P500 is on a prospective 2019PE of circa 15X. The prospects for a big rally in April are significant in my view, given the likelihood for the reporting season to deliver strong corporate earnings, the reasonably compelling forward valuation, and the likelihood for trade tensions with China and the US to ease. Additionally, back in January following the “melt-up” in stocks after one of the strongest starts to the year, markets were very exuberant. Today, the tone has markedly changed and today’s “rally fade” into the market close is highly illustrative of just how negative sentiment has become. I think this “establishes a foundation” from which the market could rally strongly over coming weeks barring any left of field developments in Washington or bad news on the inflation front this week (unlikely in my view). Time will tell and I could be totally wrong, but the US indices appear poised for a significant rally after two months of extreme volatility and pressure. However before reporting season gets underway on Friday, there are a number of key events that markets will need to absorb this week including key US inflation data and the release of the March FOMC minutes tomorrow, and Chinese President Xi who is due to give a key speech at the Boao forum later today. Trade tensions with the US will no doubt be addressed and this is what the markets will be focused on. President Trump tweeted on Sunday that “President Xi and I will always be friends, no matter what happens with our dispute on trade. China will take down its trade barriers because it is the right thing to do. Taxes will become reciprocal & a deal will be made on intellectual property. Great future for both countries!” In addition, economic adviser Larry Kudlow reportedly told CNBC the president could be amenable to forming a coalition to negotiate on Chinese trade issues. Markets are slowly turning and coming around to the view that a negotiated outcome is really the only outcome on trade. In breaking news as I write this note, the FBI have raided the office of President Donald Trump’s lawyer Michel Cohen partly over payments made to Stormy Daniels. And China has approached Vanuatu about building a permanent military base in the South Pacific raising concerns at the highest level in Canberra and Washington. I expect these stories amongst others, will dominate the media and markets today. The Congressional Budget Office (CBO) said on Monday that the US budget deficit will balloon over the next few years mainly because of deep tax cuts approved in December by congressional Republicans and President Donald Trump. The Government deficit is expected to grow to $804 billion in fiscal 2018 up from $665 billion in fiscal 2017. The CBO forecast that deficits will “increase rapidly this year and over the next few years” then stabilize, resulting in a projected cumulative deficit of $11.7 trillion for 2018-2027. 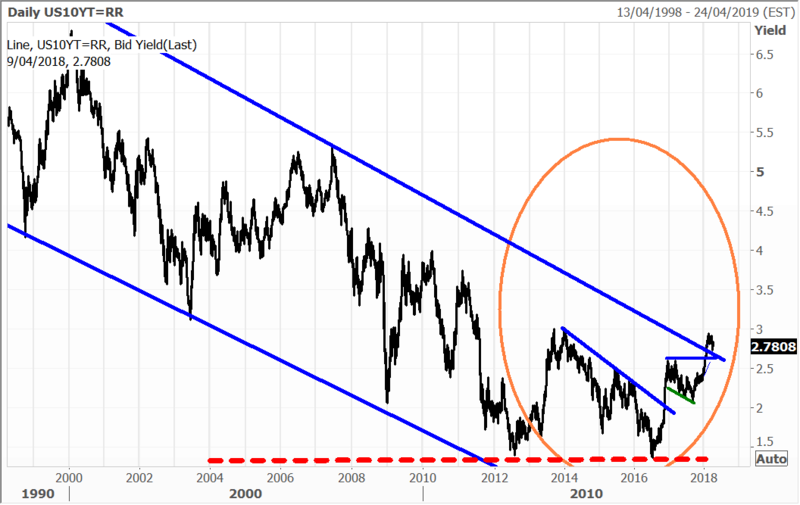 This will put upward pressure on US and global interest rates. Both Google parent Alphabet and Apple shares were up about 1.0%. Chinese online search giant Baidu gained 2%, while casino operator Wynn Resorts advanced 1.1%. Video game stocks were faring well, with Activision Blizzard up 1.9% and Take-Two Interactive adding 2%. Banks across the continent generally made modest gains. In Spain, Bankia was up 1.5% and Caixabank added 1.3%, while elsewhere BNP Paribas ticked up 0.5% and Credit Suisse closed 0.2% higher. Societe Generale on the other hand slipped 0.6%. Travel technology expert Amadeus IT gained 1.0%, while automakers BMW tacked on 1.1%. Heidelberg Cement added 0.9% on what was a relatively quiet trading day in the region. Bankia, Caixabank and Heidelberg Cement are held in the Global Contrarian Fund. Asian stocks finished broadly higher on Monday outperforming the US markets over the past few trading sessions. In Japan, the Nikkei advanced 0.51% after swinging out of negative territory early in the trading day. Defensive shares led the way, with the likes of Nippon Telegraph and Telephone (NTT) rising 1.4%. Companies that are domestic focused also did well especially the retailers on the back of the recent robust retails sales data. On the economic front, Japan’s current account surplus of ¥2.076 trillion in February was down 29% on year and short of the expected ¥2.196 trillion. After the markets closed, Bank of Japan Governor Haruhiko Kuroda gave a speech as he started his second term and said the bank will eventually need to find a way to normalise its ultra-easy monetary policy. This would be hugely beneficial for the big banks, which are under-owned and amongst the most inexpensive globally. The Global Contrarian Fund has an overweight position in Japan’s banking sector. Among individual movers, consumer goods company Kao gained 1.9%, while the big banks Mizuho, Mitsubishi UFJ and Sumitomo advanced between 0.9% to 1.3% in trading. Robotics leaders Fanuc and Yaskawa slipped 0.8% and 2.8% respectively. NTT, Fanuc, Mizuho, Mitsubishi UFJ and Sumitomo are held in the Global Contrarian Fund. The Shanghai Composite edged up 0.23% and the benchmark Hong Kong index closed 1.29% higher. China Overseas Land and Investment added 2.0%, telecom giant China Mobile gained 2.7% and social media conglomerate Tencent Holdings ticked up 1.0%. The Macau casino operators MGM China, Sands China and Wynn Macau all advanced between 0.5% to 1.2%. Oil and gas major CNOOC lifted 0.9% after reporting results. More on that later. In South Korea, technology Titan Samsung Electronics tacked on 1.6% after reporting an outstanding first quarter result last week. Asian oil and gas producer CNOOC Limited announced their annual results for the year ended 31 December 2017. Oil and gas sales for the year came in at RMB151.9 billion (US$24 billion), representing an increase of 25.2% over the previous year. The company’s average realized prices were US$52.65 per barrel for oil and US$5.84 per thousand cubic feet for natural gas. This company managed to reduce costs for the fourth consecutive year. CNOOC managed to bring all-in costs down by 6.2% to US$32.54 per barrel. Net profit increased to RMB24.7 billion (US$3.95 billion), primarily as a result of higher international oil prices and improvements made in cost reduction. The company’s basic earnings per share came in at RMB0.55 and the Board of Directors proposed a dividend of HK$0.3 per share. Chairman of CNOOC, Mr Yang Hua said: “The company continued efforts to enhance quality and efficiency through innovation and maintained strong cost competitiveness. The company increased the reserve life significantly and improved profit greatly. In the future, the company will follow the established development strategy and continue to pursue value creation to bring greater returns to shareholders.” CNOOC is held in the Global Contrarian Fund. Gold and silver producer Coeur Mining reported their quarterly production numbers for the first quarter of 2018. The company produced 3.2 million ounces of silver and 85,383 ounces of gold. Company sales of 3.2 million ounces of silver and 87,153 ounces of gold were in line with production. Coeur’s full-year production guidance of 12.6 – 13.8 million ounces of silver and 355,000 – 375,000 ounces of gold remains unchanged. As anticipated gold production was softer than the previous year due to lower grades. The company’s shares were lower by 3% for the day with the first quarter financial results expected for release later this month. 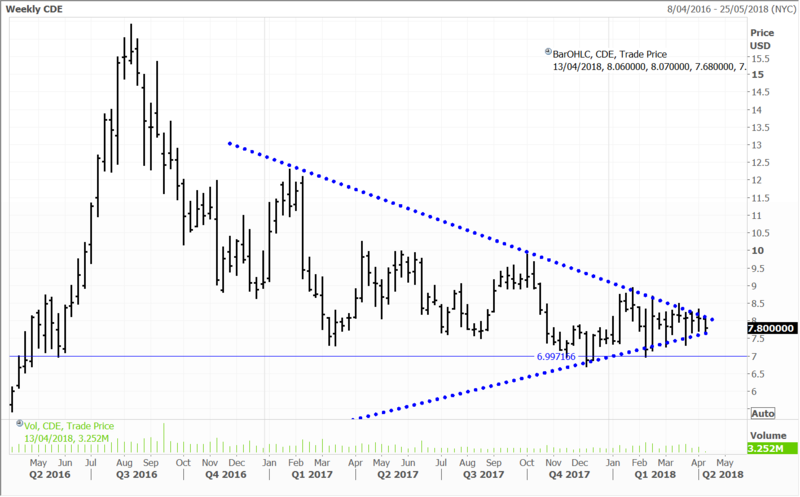 However the technical outlook is positive and after converging within a triangle range for much of the past two years, a breakout is probably imminent. 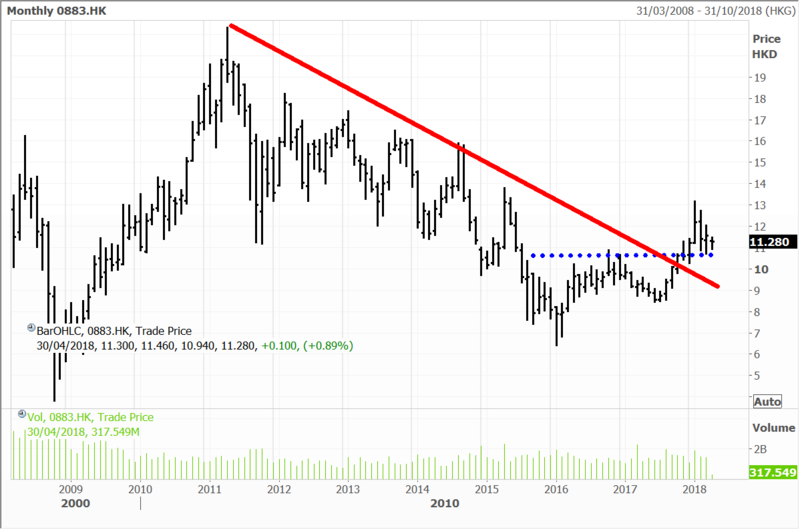 I think the breakout will be to the upside with an uplift in the silver and gold complex being the probable catalyst. Coeur is held in the Global Contrarian Fund and the International managed account portfolios. Disclosure: The Fat Prophets Global Contrarian Fund declares a holding in: Baidu, Bankia, Caixabank, Heidelberg Cement, Nippon Telegraph and Telephone, Fanuc, Mizuho, Mitsubishi UFJ, Sumitomo, MGM China, Sands China, Wynn Macau, CNOOC and Coeur Mining. Next PostNext Talking their book?